A solid, full-featured piece of equipment, offered at a good price. Recommended for: Anyone with the space, who can make full use of its capacity. 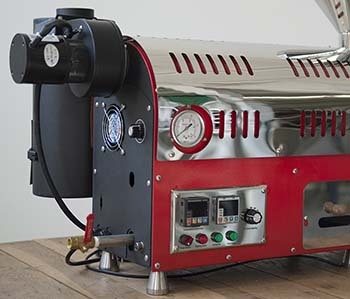 Are you in the market for a powerful, robust home roaster that won’t break the bank? Perhaps you run a small shop and plan to offer specialty coffee drinks to your guests/customers? If either of those holds true, then the North coffee roaster deserves a closer look. It narrowly missed being our overall top pick, and if you decide this is the one you want, you’ll find it to be sturdy, capable, and reliable. We’ll take an in-depth look at everything the North coffee roaster can do and has to offer in the sections below, so you’ll have all the information you need to make an informed purchasing decision. Ready to take a closer look? Let’s go! The first thing you’ll notice about the North roaster is that it’s a substantial machine, measuring 40” x 19.5” x 24” and, being mostly stainless steel, weighs in at a hefty 107 pounds. If you’ve got a small kitchen, its dimensions alone are almost certain to make it a non-starter, and given its weight, it would be impractical to have to move it around on anything even approaching a regular basis. If you’re buying a roaster for home use, the easiest and best workaround for this problem is to simply set up your roasting operation in your garage, but of course, that’s not going to be viable for everyone. All that to say, it’s a fairly self-selecting machine, at least for home use. Its size won’t present any particular challenge for most business kitchens, however, and it should fit quite comfortably. In addition to that, it’s a good-looking machine, offered in a variety of colors, so you can make it mesh well with whatever décor scheme you have. Aside from a slightly higher capacity, the only thing the ARC 800G (our overall top pick) roaster has over the North coffee roaster is the fact that it offers both Bluetooth and USB connectivity. Otherwise, you’ll find them to be functionally similar. Both are drum roasters with separate cooling and exhaust fans, and both allow total control of every aspect of the roasting process, from being able to set the rotational speed of the drum itself, to precise control of the temperature and airflow. In our roundup review, we made mention of the fact that the North roaster was only available in gas configurations, with both propane and LP on offer. That’s technically correct, but there’s a slight wrinkle that’s worth mentioning. The company also makes a separate model with all the same features that’s electric, so if you really want an electric model, you can have it. 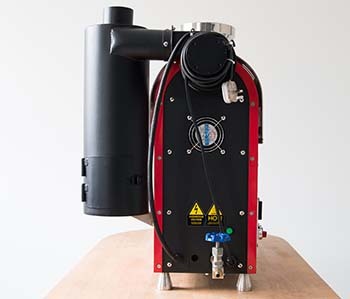 Note, however, that most serious roasters prefer gas models over their electric counterparts for the same reason that top-notch chefs prefer gas versus electric stoves. Even so, the option is there if you really want it. Also like the ARC 800G, the North roaster allows you to create roasting profiles via a USB-connected computer running Artisan Roast Profiling, or a similar software. The North coffee roaster has a maximum capacity of 1.1 pounds per batch, which puts it behind our top pick in this model’s weight class, but still quite impressive. Note: You can roast in batches as small as 100g, and we’d recommend this, especially when you’re first learning to use the machine, for reasons we’ll go into more detail on in the next section. Like our top pick, the ARC, the North doesn’t come with any presets, but you don’t really need them to get started. 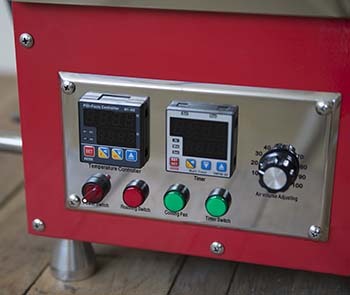 The controls are simple and fairly intuitive, and you should be able to get started almost immediately, although, you’ll definitely want to make use of the USB connection so you can start creating roasting profiles. This is the reason we recommend that your first several batches be on the small side. You’ll want to test and experiment to get a feel for the unit’s operation, and once you’ve completed what you regard as a satisfactory roast, it’ll be easy to reproduce it, at which point, you can fill the drum to capacity with confidence! The North’s smoke suppression is really smoke redirection, and it does a decent job at venting it somewhere where you aren’t. Having said that, you’re still going to want to either take the batteries out of any nearby smoke detectors, or simply set the machine up in an area where there aren’t any, or you’re almost certain to be “treated” to musical accompaniment every time you use the machine. As ever, if you opt to pull the batteries from nearby smoke detectors, just be sure you put them back in when you’re done! As we mentioned in a previous section, even without any presets, using the machine is a fairly straightforward affair. Beans go into the drum, you rely on your eyes to monitor the color changes, and your ears to listen for the first and second crack, let the beans cool, then store for later use. From a top-level perspective, that’s about all there is to it, but to borrow an analogy we’ve used elsewhere on this site, working with the North roaster is a bit like learning to play chess. You can get the hang of the basics in mere minutes, but it’s going to take time, practice, and patience to truly master it. Go slow. Do a few test batches to build roasting profiles, then ramp your production up, experimenting as you feel you want or need to, and continue to explore the machine’s capabilities. You’ll be producing amazing coffee in no time. Overall, the chaff management is quite good, although, it should be noted that this is going to depend a lot on how clean you keep the machine. The less often you give it a thorough cleaning, the more issues you’re likely to see with chaff collection. Speaking of cleaning, all the major components of the roaster are easy to get to, so cleaning won’t be a problem. A good rule of thumb is to give it a thorou​​​​gh cleaning about once every five batches, although the exact frequency will depend on how dark you like to roast your beans. The darker your roasts, the more frequently the machine will need to be cleaned. Let your eyes be your guide here. No Bluetooth option - USB only. Again, a very small point, but if you’re not a fan of cables strewn everywhere, it’s something to consider. Space will be a factor for home use – This is more a matter of careful planning before you buy than an outright negative. Just be mindful of the fact that you’re going to need 24” of clearance all around the machine, and plan its location accordingly. Chinese manufacture – While Chinese manufacturing has improved, it’s still a far cry from German, Swiss, Italian, etc., and the machines haven’t been around long enough to get a good handle on their longevity. Unfortunately, Mill City has had an inordinate percentage of customer complaints re: after-sales support, which may give some people pause. Combine that with the fact that the equipment comes from China, and getting it repaired under warranty could present some challenges. 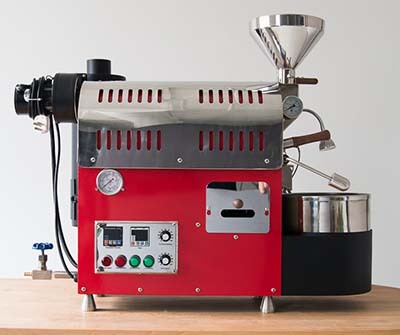 We like just about everything about the North coffee roaster. It’s undeniably a great machine, but as with the ARC 800G, it’s also a fairly self-selecting one. If you don’t have space for it, or if you just aren’t going to use its capacity to its full extent, then there’s no point on spending the money on a unit like this. You’d be better off going with something smaller and cheaper, like a Hottop. North 500g Gas Roaster User Manual. North Roasters. Official Brand Website. Light Roast Vs. Dark Roast Coffee: Which Packs More Health Perks? Health. The Anatomy of a Roast Profile. Cafe Culture.